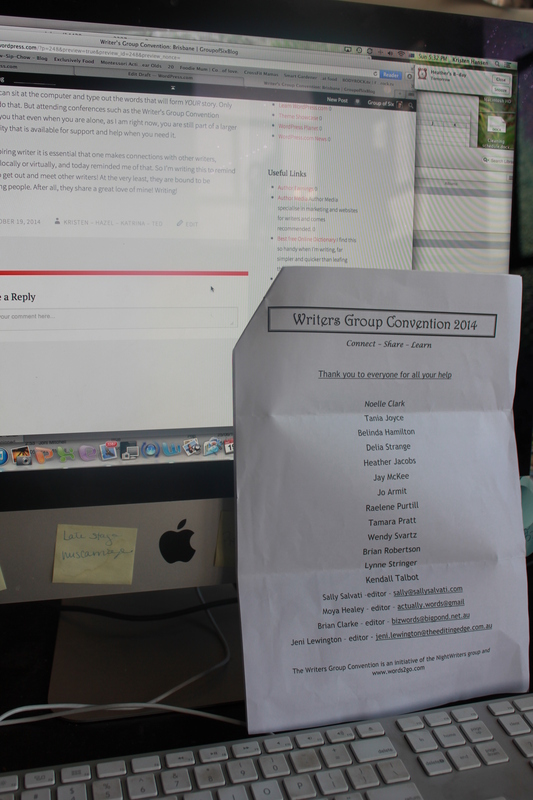 Today Ted, Hazel, Katrina, and myself had the opportunity to attend a Writer’s Group Convention held here in Brisbane. The Convention was the initiative of the NightWriters group and http://www.words2go.com and was chaired by the wonderful Gillian Lloyd. We had the chance to hear from several key speakers who discussed the road to publication, ways we, as authors, can hone our craft, and other topics. Some of these were simply reminders of things that I already knew, while others were more revelatory. But as we sat there I realised that the main thing I was getting out of the Conference was the sense that I was part of a bigger community of writers. The 4 of us in our group are a great support for each other, but at the end of the day, writing is a solitary endeavour. No one else can sit at the computer and type out the words that will form YOUR story. Only you can do that. But attending conferences such as the Writer’s Group Convention reminds you that even when you are alone, as I am right now, you are still part of a larger community that is available for support and help when you need it. As an aspiring writer it is essential that one makes connections with other writers, whether locally or virtually, and today reminded me of that. So I’m writing this to remind myself to get out and meet other writers! At the very least, they are bound to be interesting people. After all, they share a great love of mine! Writing!